I wasn’t sure what to expect with this recipe. 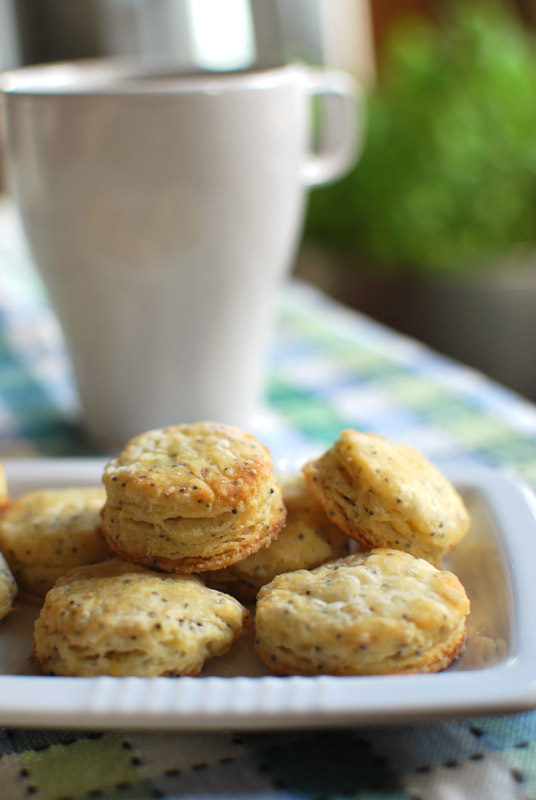 The title described them as crackers, the headnote referred to them as Scottish biscuits (more akin to an undersweet cookie), and the recipe itself looked like one for a proper Southern (American) biscuit. But the flavors intrigued me, citrus and sesame, and no matter what sort of thing I ended up with, I would surely be happy, being a fan of all three possibilites. The golden things I pulled from my oven less than an hour later were not exactly cracker, biscuit, or (ahem) biscuit, but had characteristics of all three. If I’m honest, they were most like tiny and flaky American biscuits in both method and appearance. But they had a cracker’s crunch, and the half-sweet half-savory nature of a British biscuit. Had I rolled the dough more thinly, the crunch would’ve been more pronounced; either way would produce just as delectable an item. As excellent as the light texture was, the real glory of these treats was the fantastic balance of flavoring. A good part of the liquid in the dough are orange and lemon juices, which are amplified by the incorporation of the zest of both fruits. The original recipe called only for sesame seeds, but I couldn’t help adding poppy seeds, as I’m such a sucker for the way their seductive and earthy flavor complements the nutty taste of sesame. The overall effect was extremely delicious, brightly flavored and complex without being rich. Flaky, crunchy, miniature, and pretty as a picture, this is definitely one for the permanent file. 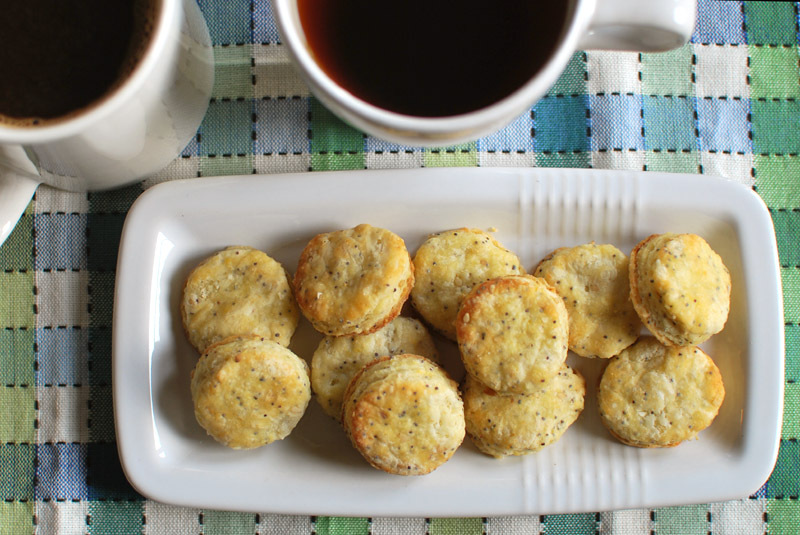 These little biscuits, or crackers, or what-have-yous make a fetching array of sunshiny little bites, ideal for dunking in a hot cup of coffee or tea, or simply as a special snack whenever. Rolled more thinly and baked to a less-fragile state, I can see them wrapped in a clear cellphane bag, tied with a pretty ribbon, as a most charming gift. Not quite sweet, not quite savory, not quite biscuit or cracker, they’re the best of all worlds in one tiny package. 1. Preheat oven to 350º F. Line 2 baking sheets with parchment paper. 2. Cut butter into as small pieces as possible, and pile loosely on a plate or in a bowl. Put in freezer while preparing remaining ingredients. 3. In a large bowl, whisk together the flour, sugar, salt, and baking powder. Add the orange and lemon peel, and whisk to blend. Add the partly-frozen butter, and quickly toss and pinch with fingertips to blend in, or cut in with a pastry blender. The mixture should look like coarse meal; pea-sized lumps are okay. Mix in the sesame seeds and poppy seeds. 4. Add the egg, orange juice, and lemon juice. Using a nonstick spatula, gently and quickly toss until moist clumps form, adding buttermilk (or other dairy) by tablespoonfuls if dough is dry. Turn the dough out onto a floured work surface, and knead gently a few times, just until the dough comes together. 5. Using additional flour as needed to prevent sticking, roll the dough out to 1/4 inch thickness. Using a 1½ inch round cutter, cut out as many rounds as possible. Transfer to the prepared baking sheets. Carefully gather dough scraps together, pressing cut sides together to reform into a roughly flat shape. Reroll, cutting out additional rounds as before. Arrange on prepared sheets. Bake until firm to touch and cooked through but pale, about 15 to 23 minutes, depending on thickness. Let cool briefly on baking sheet before serving warm or at room temperature. 1. I rolled my dough to about 1/3 inch thickness, as I was a little scared of toughening them. The biscuits took about 21 to 22 minutes to cook, and the ones around the outside of the baking sheet were just barely golden. They were all crunchy and fully cooked, and were very flaky. If you want a more crackerly item, roll them thinner and bake until just done. These sound exactly like the sort of recipe I love, unusual and tasty! They sound like they’d be great with tea. Alyssa: They were fantastic with tea. And coffee. And wine. 😉 These are actually one of my favorites that I’ve made in recent memory; they’ve got such an unusual and delightful flavor. And tiny, to boot! 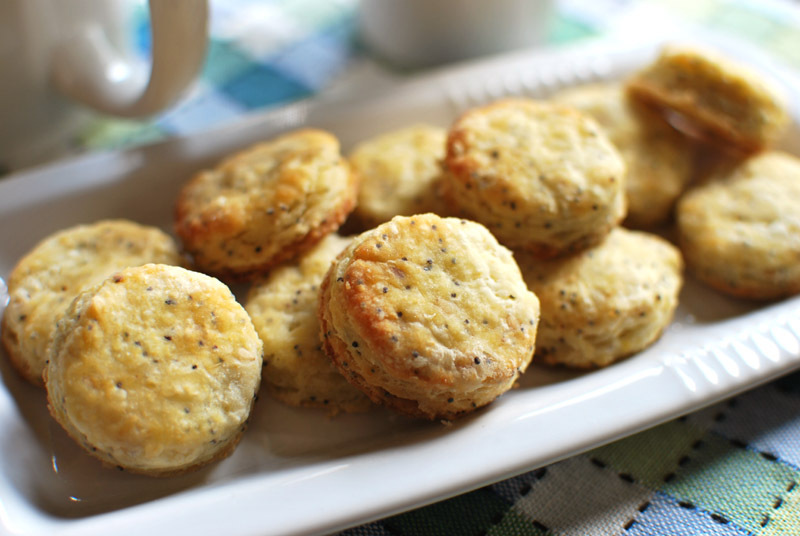 Who doesn’t like tiny biscuit cracker things? No one, that’s who. Oh, these look fantastic. Thanks for the inspiration.